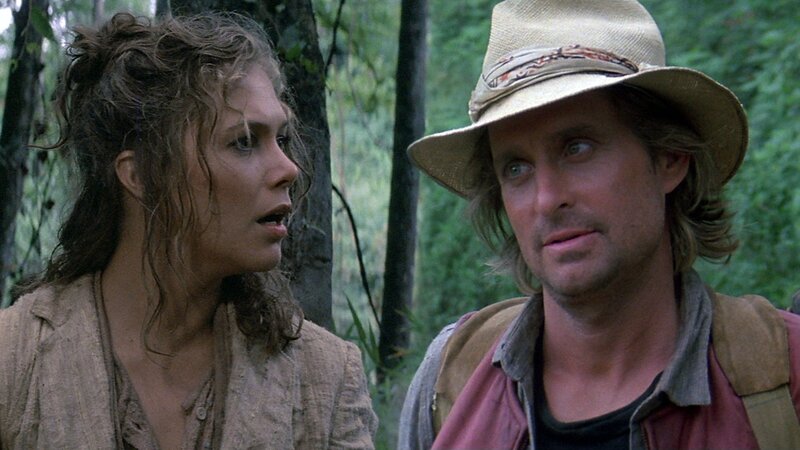 Rekindling my love for Romancing the Stone propelled me onward. My wife and I tossed in the much maligned sequel Jewel of the Nile, a movie I remembered as trite but entertaining. An innocent lark that didn’t live up to expectations. Or was that just widespread popular consensus encroaching on personal taste? 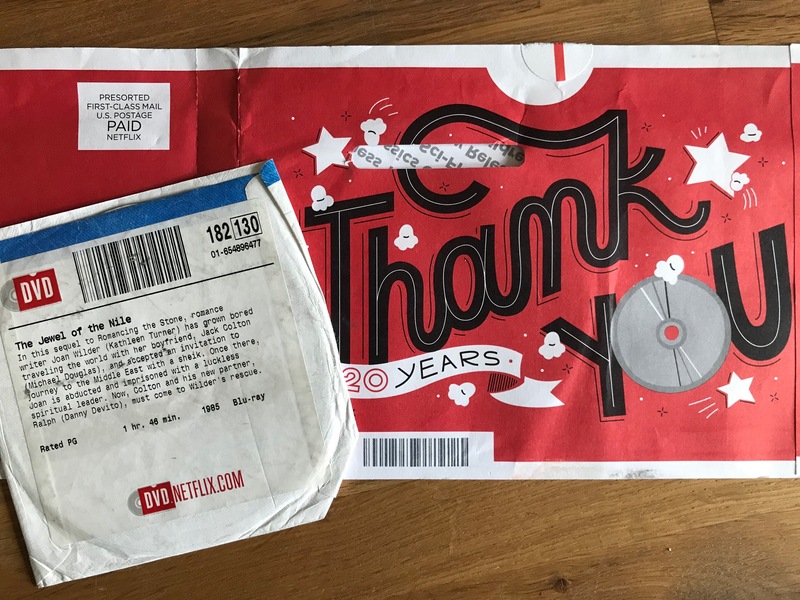 I ordered up the Blu-ray from Netflix and hunkered down to complete the Turner/Douglas/DeVito trilogy. Obligatory proof of physical media because PHYSICAL MEDIA. Jewel: What are you doing? Joan Wilder: In my last novel, ‘Angelina and the Savage Secret’ Angelina used a nail file to chip away at the bars of her cell to remove them and escape to freedom. Jewel: How long did this take? Romance novelist Joan Wilder sails the seas, explores exotic ports of call with newly-minted man of leisure Jack Colton until the restless, writers-blocked Joan sets off for North Africa with the first man who takes her seriously as a writer. It just so happens he’s a cruel authoritarian dictator who wants her to write propaganda or die so he can put on a Laser Floyd show and convince everyone he’s some sort of mystical cleric. Meanwhile Jack and his new partner-in-crime Ralph set out to maybe rescue Joan but definitely find the mysterious and fabled Jewel of the Nile. No Sheep is Safe Tonight! 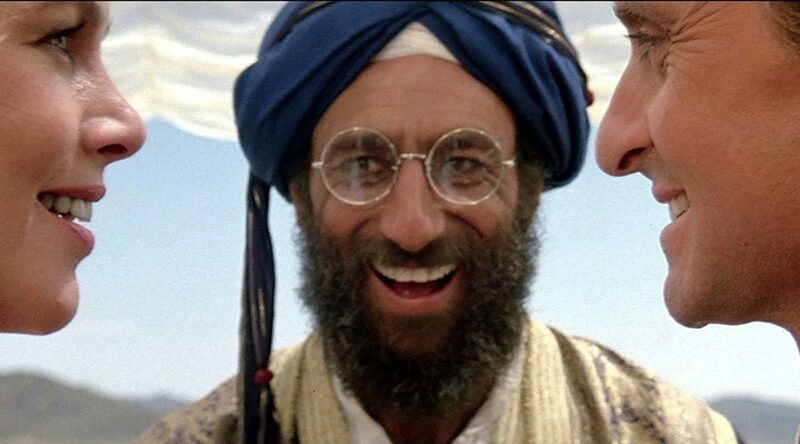 Foggy images of Danny DeVito in a makeshift turban. The only trace memory left about Jewel of the Nile. Much of it came flooding back during my viewing, but not exactly as I’d recalled. Director Lewis Teague carved out a niche in the horror genre during the early 1980s having directed Alligator, Cujo and Cat’s Eye. When Teague attempted to break away from the genre and prove he was more than just another hack horror director from the Corman filmmaking machine, he displayed the hammer-fisted nuance of someone who hadn’t apprenticed under Sydney Pollack or edited films for Monte Hellman and Jonathan Demme. Lewis Teague proved capable of showcasing extraordinary vistas, but little else in this big-budget misfire. Robert Zemeckis had abdicated the director’s chair, presumably because he’d already begun production on Back to the Future. Not that Jewel had ever been a desirable property for the up-and-coming director. 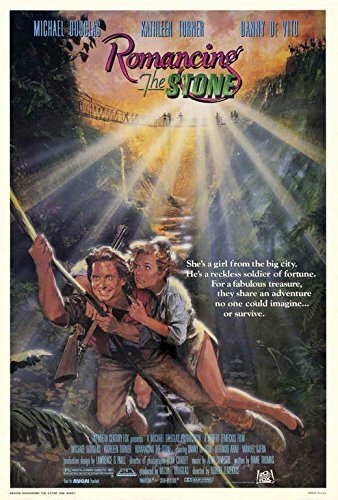 20th Century Fox had been blindsided by the $115million international success of the $10million Romancing the Stone and immediately rushed Jewel into production. By giving an 18-month start-to-finish turnaround time for the sequel, Fox alienated its writer and stars and made Zemeckis’ return an impossibility. Once More Into the Breach (of Contract), Dear Friends! 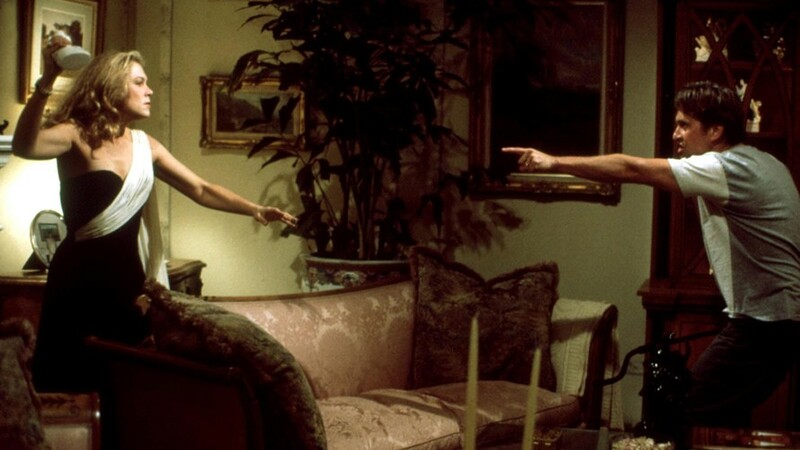 Fox exercised the sequel option embedded in the contracts of both Kathleen Turner and Michael Douglas. Douglas approached Stone writer Diane Thomas about penning the sequel. Due to some combination of money, timing and/or commitments to Steven Spielberg (her script for him would become Always), Thomas wouldn’t come aboard this anti-pleasure cruise. Douglas, stuck in the dual roles of reluctant star and reluctant producer, had to carry on with Jewel pre-production while filming A Chorus Line for Richard Attenborough. Douglas approached writers Mark Rosenthal and Lawrence Konner — a writing duo that had nothing but TV credits to their names. (They would go on to write scripts for Superman IV: The Quest for Peace an Star Trek V: The Undiscovered Country. Despite her contractual obligation, Turner tried to back out of the project, calling the script “terrible, formulaic, and sentimental.” Fox threatened Turner with a $25million breach of contract lawsuit, and Turner returned only after Douglas promised rewrites on the script. 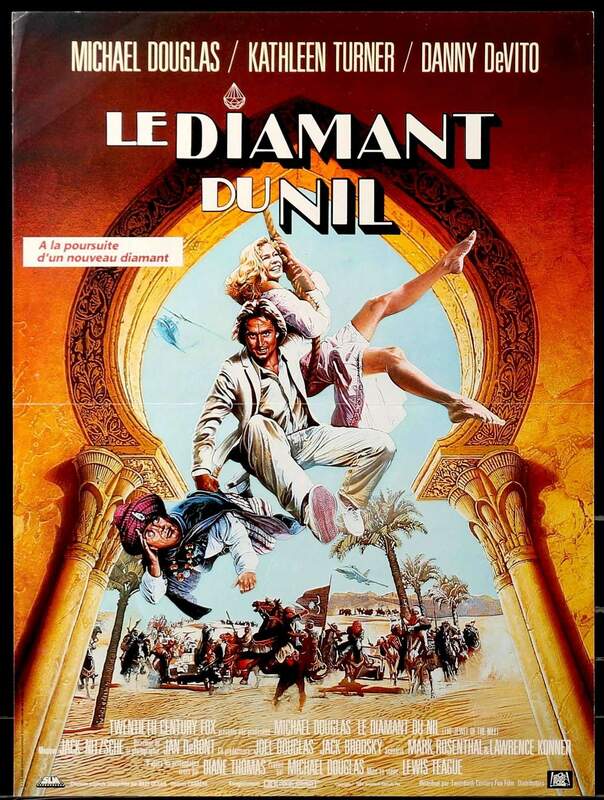 Douglas and Turner attempted to cobble together something resembling an acceptable script from various drafts while in their Moroccan hotel as The Jewel of the Nile prepared to shoot. In her Vulture interview, Turner indicates that she never found any comfort in their efforts to resuscitate the dead fish penne by Konner and Rosenthal. From there the production went further downhill. First, there was the oppressive heat. The production also had to bribe local officials to push filming equipment through customs. A plane crash killed production designers Richard Dawking and Brian Coates while scouting locations. Even Douglas and Turner had an air scare when severe winds made for a tense a landing in Morocco. And now we’ll return to Lewis Teague. Teague, who’d been weened on small, tightly controlled productions found the demands of a rushed Hollywood blockbuster unwieldy. After hours of staging and preparing a complicated night scene, the director discovered that they’d neglected to put film in the camera. The shoot had to be rescheduled entirely as the film crew scrambled to find more film stock. Despite tepid reviews and unhappy fans, The Jewel of the Nile’s ($75.9million) domestic box office rivaled that of Romancing the Stone ($76.5million). Some of the spirit of adventure and banter remains, but The Jewel of the Nile is a desperate, tiresome movie shadowboxing its far superior predecessor. Like Romancing the Stone, Jewel opens with a scene from Joan’s novel in progress, a swashbuckling pirate adventure on the high seas. The scene in Stone developed the hopeless (and gullible) romantic inside Joan Wilder and set our expectations for the inevitable arrival of Jack Colton (only to have them undermined by the less than chivalrous reality of a treasure-hunting mercenary). The Jewel of the Nile uses this scene as a gag that fails to propel or inform anything that subsequently happens in the story. It’s an empty recall. The writers failed to grasp how the scene served the film. This, unfortunately, becomes a common theme. Jack Colton becomes a Budweiser swilling, woman-ignoring man of leisure while Joan reverts back to cat-lady Joan with sunscreen plastered on her nose, slaving away all day on a book she can’t finish. Somehow, the writers of The Jewel of the Nile managed to transpose the moldy, 1950’s “man of the house” relationship onto these exotic adventurers. While the narrative certainly proves problematic, Turner could have used a rewrite on this dress. The movie takes liberties with the characters in the name of narrative convenience. Jack catches a case of petulant jealousy. Joan seizes her latent need to become a serious writer and, rebelling against Jack’s condescension, accepts the first offer that comes her way. Obvious fascist potentate: Hi. You don’t know me. I’m a great admirer of your work, Joan Wilder. I’m also a great great great great man who is not entirely dangerously full of himself at all. Won’t you write my biography? Joan: YES! YES! A THOUSAND TIMES YES. Jack: Maybe you should rethink this. Joan: YOU JUST DON’T THINK I’M GOOD ENOUGH. Jack: Maybe that’s the way it came out because the movie needed to manufacture artificial drama by making me the ignorant man, but I honestly, really, truly think that you’re making a poor decision running off with this man that is clearly a dictator. Jack: FINE. I’LL JUST COME GET YOU IN A MINUTE, THO. 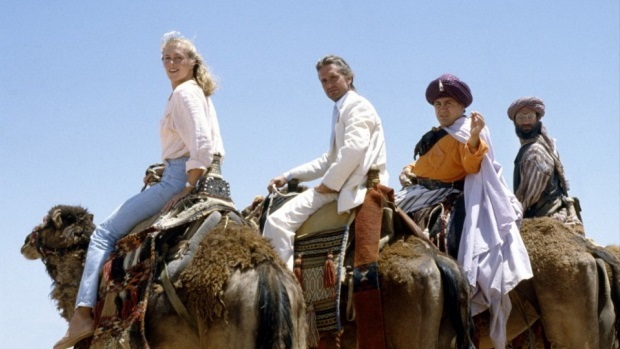 WE’LL ENJOY SOME AWKWARD POTENTIALLY RACIALLY PROBLEMATIC ADVENTURES THROUGH NORTH AFRICA! Much of The Jewel of the Nile fills me with disinterest, but there’s a creative spark that prevents me from dismissing it. The hook that the Jewel isn’t actually a gem, but a person, elevates the film over the pusillanimous goings-on. Avner Eisenberg, the American vaudevillian/magician/mime, steals the show. He’s a gifted comic performer and the only reason (other than Turner’s spirited performance) to endure the final third of the film. I’ll admit to enjoying the last part. But this criticism highlights the major problem with The Jewel of the Nile. Like Romancing the Stone, the pleasures are to be found in the smaller moments. 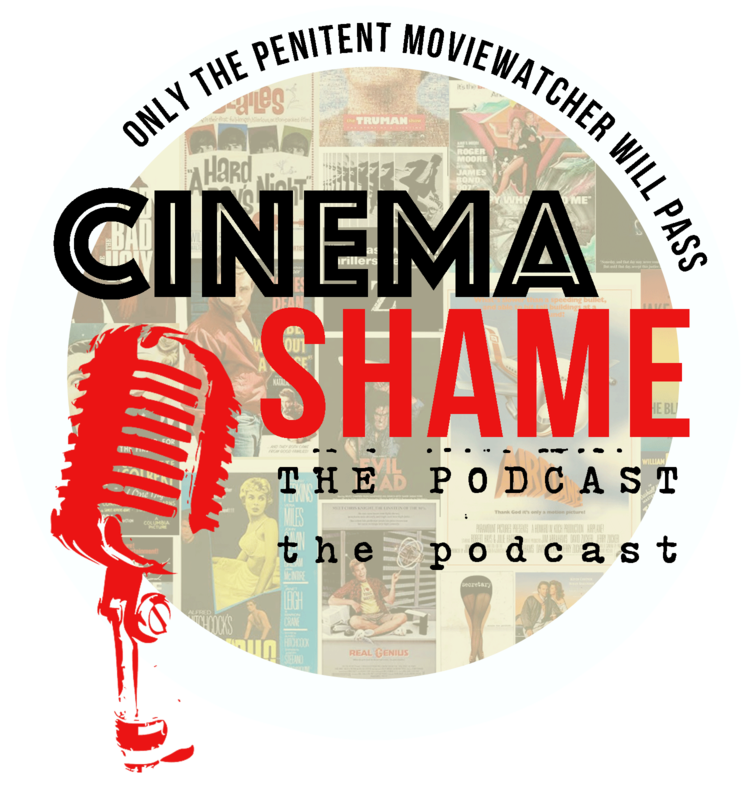 Barbed dialogue, the wit and charm of its actors, and comfortable genre familiarity. The Jewel of the Nile amplifies the aspects of the original that had been limited by budget at the expense of creative ingenuity and the chemistry between Douglas and Turner. In other words, all the worst tendencies of a sequel. James David Patrick is a writer. He’s written just about everything at some point or another. Add The Jewel of the Nile to that list. Follow his blog at www.thirtyhertzrumble.com and find him on Twitter, Instagram, and Facebook.